Are you starting to see a dent in your UFO pile? This is the fourth month for the 12 in 2014 challenge. If you haven't joined in yet, go to this post to see how it works! And BTW, it's OK to send your finish as soon as you have a photo -- you don't have to wait until the last day of the month. I showed off my April UFO finish on Friday's post, "Thank Goodness It's (Barely) Finished Friday." If you saw my "test post" from my new iPad yesterday, you saw a glimpse of my May UFO project. 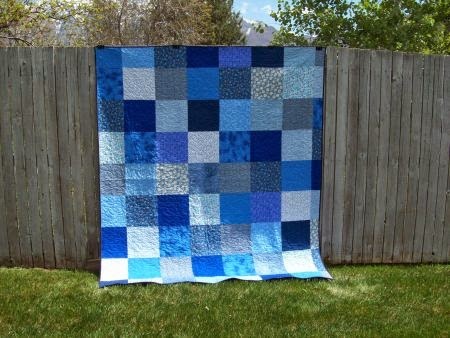 It's "Bounce" by Carrie Nelson of Miss Rosie's Quilts. 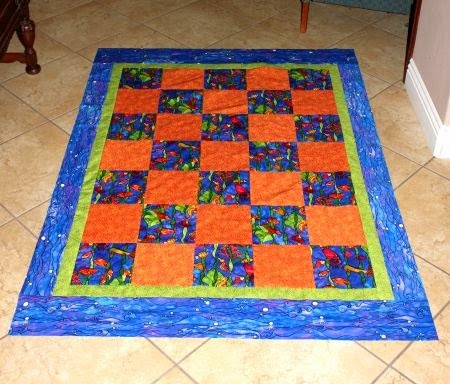 I made it at Cindy's quilt retreat two autumns ago. When I got home and took photos of the "finished" top, I realised I had done the borders wrong. I love the fabric so much (Tula Pink Birds and the Bees) that I decided to un-stitch the borders and re-sew them. The first April finish came in early in the month. 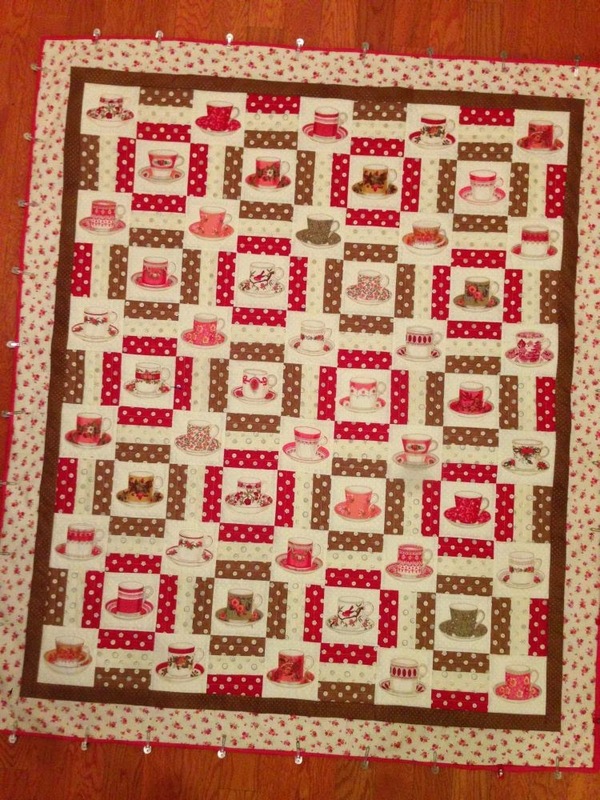 Elisa finished this quilt for her daughter's birthday the first week in April! Elisa, I love that you found the silver lining! Elisa says this quilt is for her, read all about it on her blog "Yarn Tails" here. 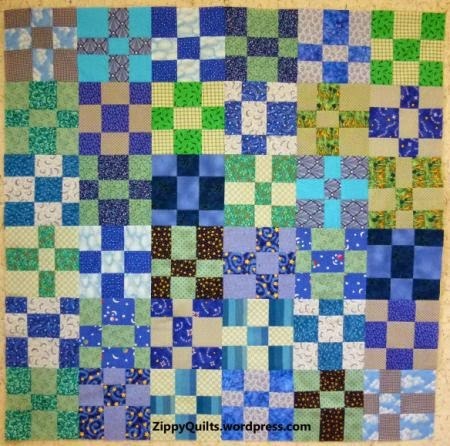 Be sure to go to Mary's blog post at Zippy Quilts, here, and read her tutorial on this UFO finish. What an excellent way to use up scraps, Mary! Mary writes she just started the UFO Challenge in April. She is so pleased with her progress, she's decided to go back and finish one for February-forward! New grandmother Martha reports that the grandbaby is keeping her from her "work." But she managed to finish this "vintage" (that is, purchased a long time ago!) beauty. 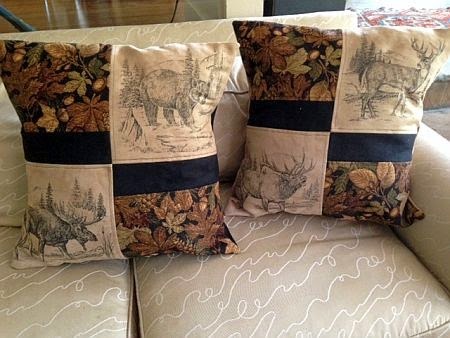 These were pillow kits on the latest shop hop in Idaho for $29 each pillow. Ultra suede tapestry and for animal motifs. They were quick to finish and will look great in the cabin! She offers to provide info if you want some for your own mountain retreat. 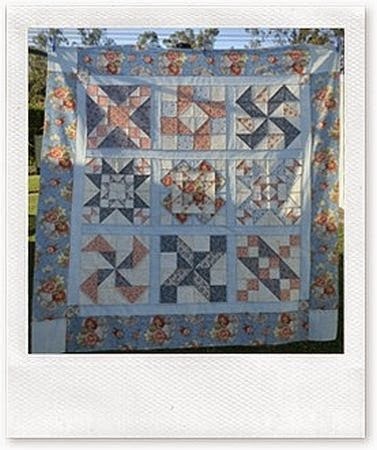 Email me at AuntMarti at 52quilts dot com and I'll forward your email to Martha. 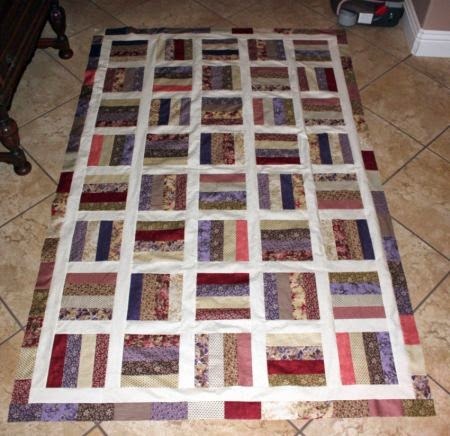 Becky finished this Bonnie Hunter Bargello quilt and sent a photo to Bonnie. And Bonnie Hunter commented on it on her blog! Becky even took a page from Bonnie's book and pieced the back! Good on you, Becky! 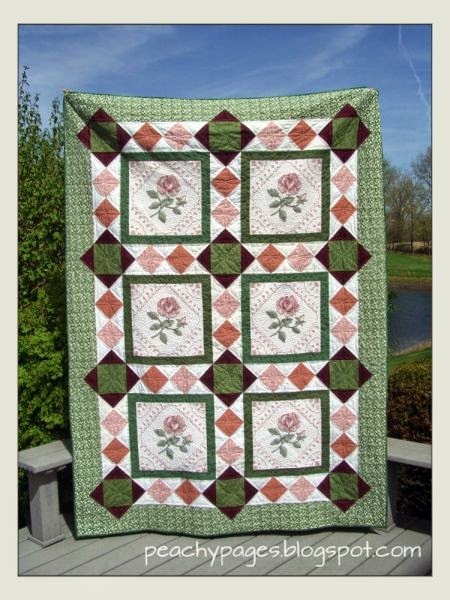 And I'm sure the recipient will love this quilt. That Martha! She has a third finish for April! I'm really excited to share this one with you, because the designer is a personal friend, Melissa of We Shall Sew. You can get the pattern free from Robert Kaufman, just go to their website here. There is a second Hope Takes Flight pattern using batiks, also free here. I love Sue's May finish. 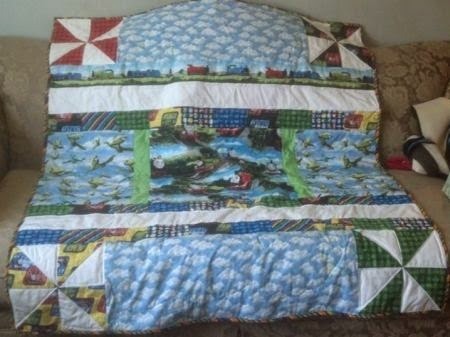 I've "pinned" it to my Quilt Wishlist on Pinterest! 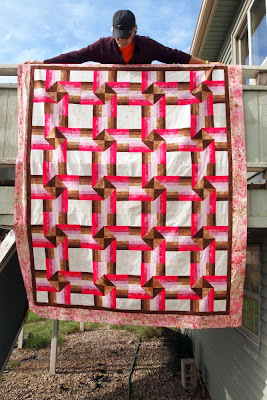 She made it with the Molli Sparkles Broken Herringbone QAL last year. 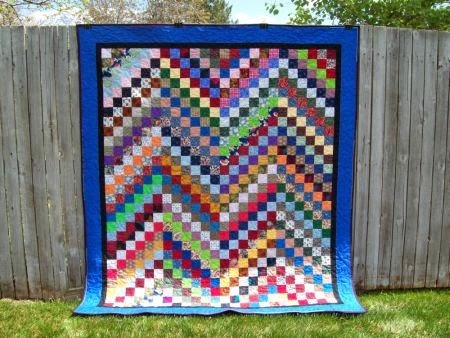 I don't know how I missed that, because I love this quilt! (I already said that, didn't I?) Sue blogged her story at Sue's Quilty Bits and Bobs, here. 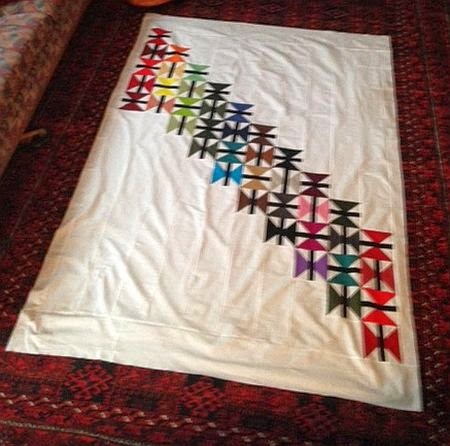 Oh, look at this gorgeous quilt Heather finished! She found a baggie of 10-year old cross-stitched roses and calculated the setting herself. 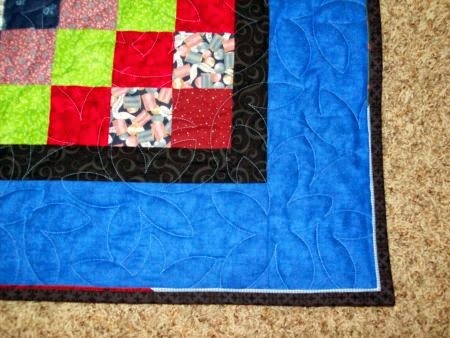 She even did the custom quilting - isn't it gorgeous? I had to make the photo extra large so you could see the lovely cross-stitch roses. Wow, Heather. Just. Wow! Here is a link to her blog, Peachy Pages, which has the rest of the story. 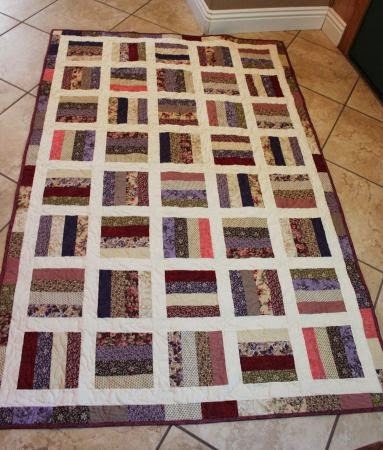 I hate to admit it but several years ago when I was attending the local quilt guild I was given a charity quilt to piece into a top. I am sorry to say I found it last year buried on a shelf with other UFO's when I was pulling stuff out of my sewing room. . . . . 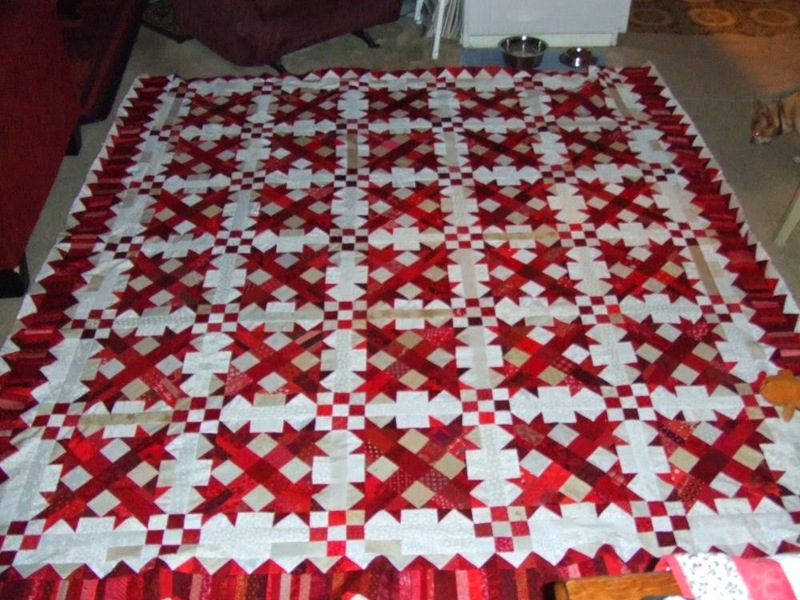 This quilt top is long over due...that is why it is my 'guilt' quilt. Every time I have run across it in the last year I have felt guilty that it has taken me so long to complete. Nancy, I think you did a great job and now you can let go your guilt! Betsy completed this darling Halloween quilt from 2007 or 2008. My favorite holiday -- 'cuz you get to dress up, ring strangers' doorbells and demand candy, right? Katie finished a long-time UFO at the request of her husband. 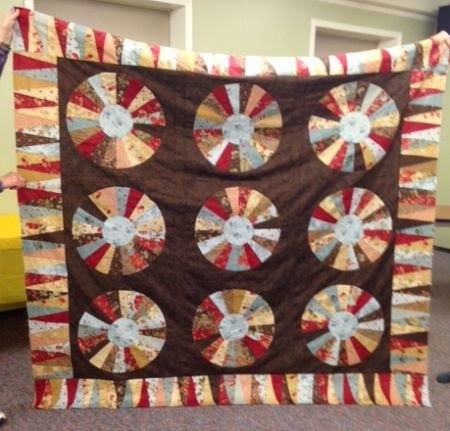 This quilt is one I started in a class in 1995 at Asilomar's Empty Spools Quilt Conference. 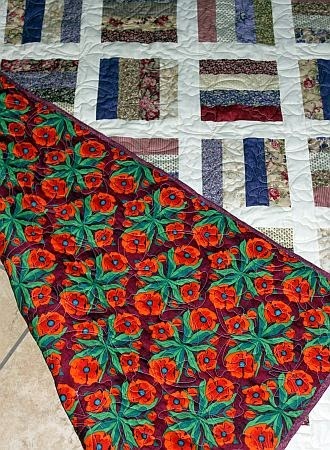 It was hidden away for years when I wasn't quilting. My husband kept asking me to finish it. So last year when I found my unfinished quilts after having put all quilting away for almost 20 years, this was one that begged to be finished. I will say it is the hardest thing I have ever done, but in the same instance, probably the most rewarding. The machine quilting was done by Heart to Heart in Merrill, OR. She did a beautiful job interpreting what I felt would be the other natural elements in the scene, i.e. the wind, water, weeds, etc. Love it, Katie, and thanks DH for getting her to finish it! Just in time for my 4 year old to start phasing out of his love for The cloud fabric on the top and bottom glitters, and is from my Grandmother's stash. She passed in 2005. My son and I are both thrilled it's in his quilt. Here are my April finishes - previous UFOs from your challenge - which I quilted and bound this month. One is a scrappy trip with 1 inch straight(ish) line quilting and the other is columns of flying geese which has a dense all over stipple. It feels good that these are now finished and will not be added to next years challenge! Gill, you know I really admire all those Flying Geese! What do you see in the focus blocks? Click on it to enlarge. I meant to use this quilt to really focus on my 1/4" seams, pressing, and piecing, but turns out that I did most of it in a room with the lights off. My grandnephew was sick, and they were always trying to get him to sleep while I was trying to sew. Oh well...He's worth it. The name is from his Dad, who saw the quilt from a distance, and questioned why all of the frogs were pink. He laughed when he saw it up close. Since I use floral frogges when I make arrangements in my real teacups, the name seemed appropriate: Teacup Frogges. Say, Donna, are those some A Quilt Block a Day blocks I see peeking in at the right-hand side of that photo? Donna is a quilter after my own heart -- no applique'! She decided to add a HST border rather than all that applique'. I think you made the right choice, Donna! Noela finished her April UFO during a FNSI (Friday Night Sew-In). Be sure to go to her blog, Quilty Bits from the Blue Room to see the clever light her son gave her to help with nighttime outdoor sewing! This is a great design by Bonnie Hunter. 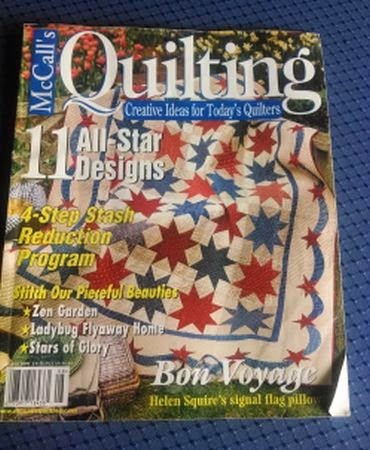 Who would have guessed a block in Quiltmaker;s 100 Blocks Volume 5 Magazine could turn out to be such a wonderful project with the layout she created. Talkin' Turkey is one that a bunch of us who regularly swap components for Bonnie Hunter designs have been interested in creating. 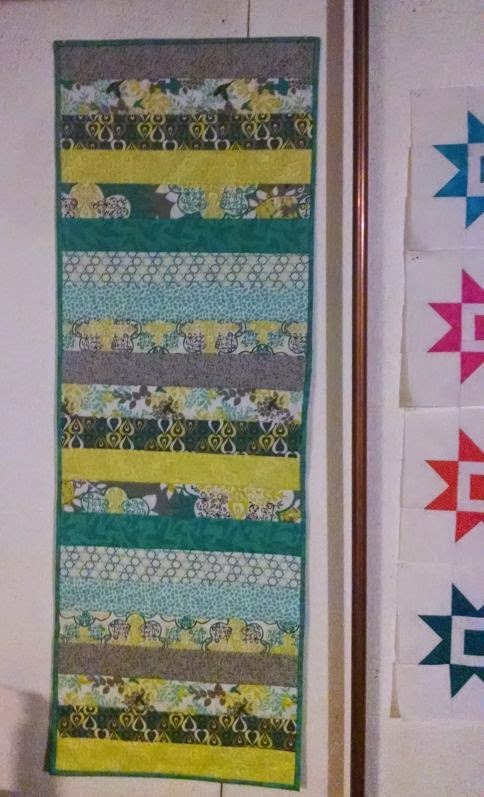 I coordinated a block swap that started late last year and was finished in January. It had everyone swapping the strings that make the corners of each block and the nine-patches that are the center of each block. All the remaining parts were up to you. 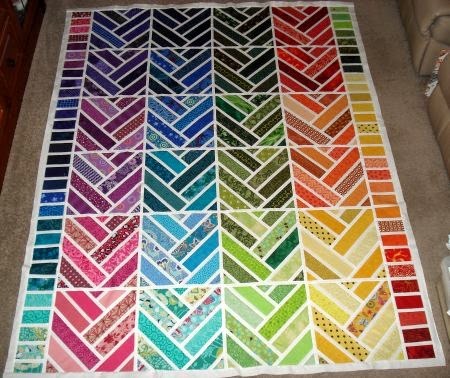 I did manage to double the requirement for the flying geese units...I think I have enough for a second quilt! A reader on my blog came up with the clever name that I just love! 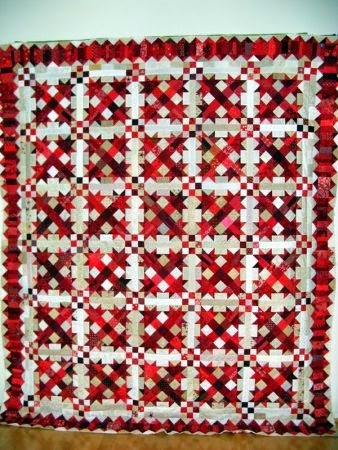 You may recall that all of Sandi's quilt names begin with the letter "k." This one is named Kranberries. You can read more about Sandi's quilt on her blog, KwiltnKats, here. 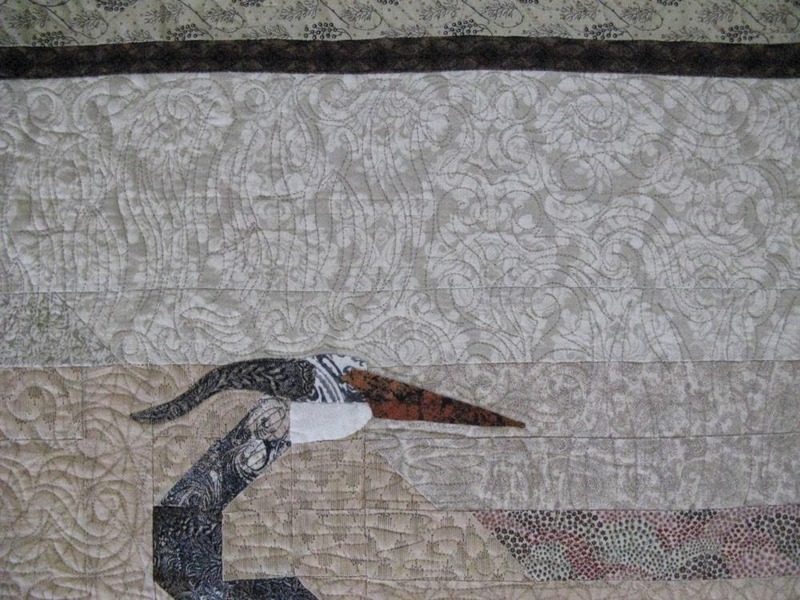 Here is the second "Talkin' Turkey" quilt, this one by Debra B. Gosh, you two, I wish I lived close enough to be in your Bonnie Hunter group! Quite few of us did a swap (Sandi Delman, coordinator) of the strings that were used in the individual blocks surrounding the 9-patches. We were on our own with the outside border strings - boy-oh-boy do they ever take some time to do. I love how the quilt came out. It barely fit on my living/dining room floor. 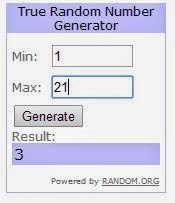 Let's see who the Random Number Generator picks for the UFO Parade winner. Oh, look, it's Mary! A first-time finisher -- I like that! Congratulations, Mary, I'll be emailing you asking for your postal address. And I'll find a nice surprise to send you! I'm going to a "SpinFest" retreat this weekend, so I'll be posting from my new iPad. Yippee! Congratulations Mary! Wow a bunch of finishes this month. How do we keep it up now that the weather is improving? Wow I'd hate to see what Martha can do when she's not being kept busy by a new grandchild! A bumper batch of finishes this month, well done to everyone! Congrats to Mary and thanks Marti for hosting, I just love this UFO along, I wouldn't get anywhere near as much done without that deadline each month! 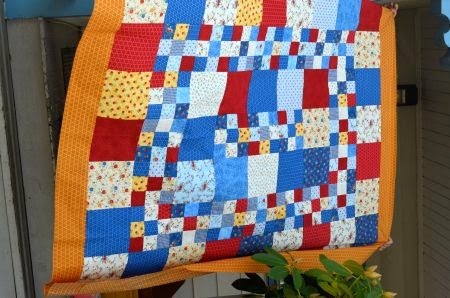 And I really love Sue's quilt! If I had any spare time, I would make it with you. So pretty! Nancy you got it done and that's what counts. 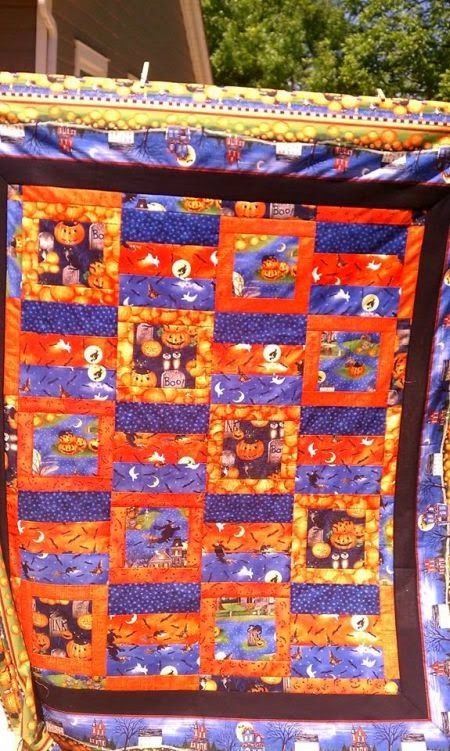 Betsy's Halloween quilt is really cute--can I say Trick-or-Treat in May? Katie your birds are just beautiful...Kerry who also contributes to the Marti's Parade is at Asilomar this week with the Dear Jane queen, Brenda P. I hope some day I'll get there too. What a wonderful treasure Amy and her son have, I hope he can enjoy Thomas a bit longer... I'll be back Marti! 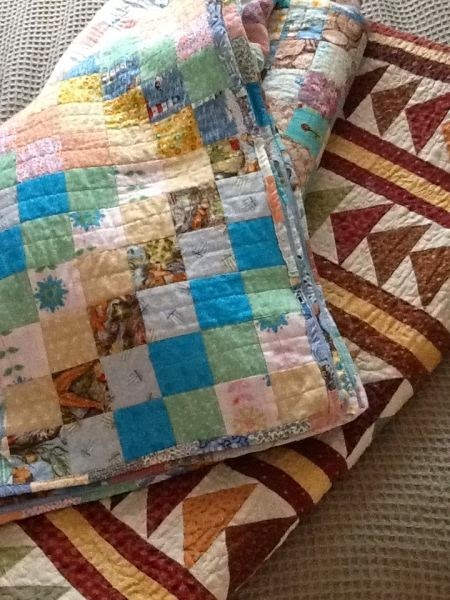 thanks for sharing all these fabulous quilts Marti! Wow! What a great parade. 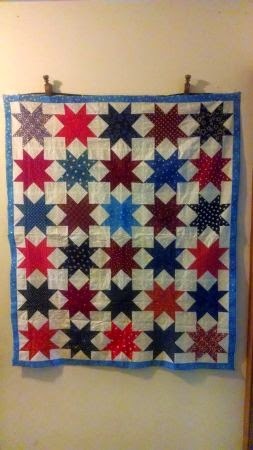 I love the scrappy centers in Aunt Marti's Stars, and congrats to Donna for getting her All-Star quilt completed. 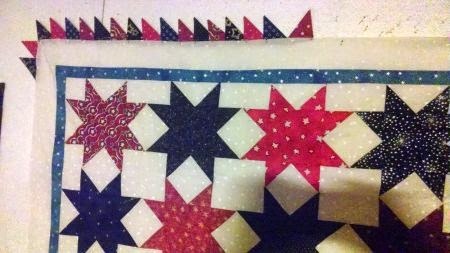 The border additions on Elisa's and Sue's quilts show what the perfect finishing can do for a quilt. Great ideas from both. 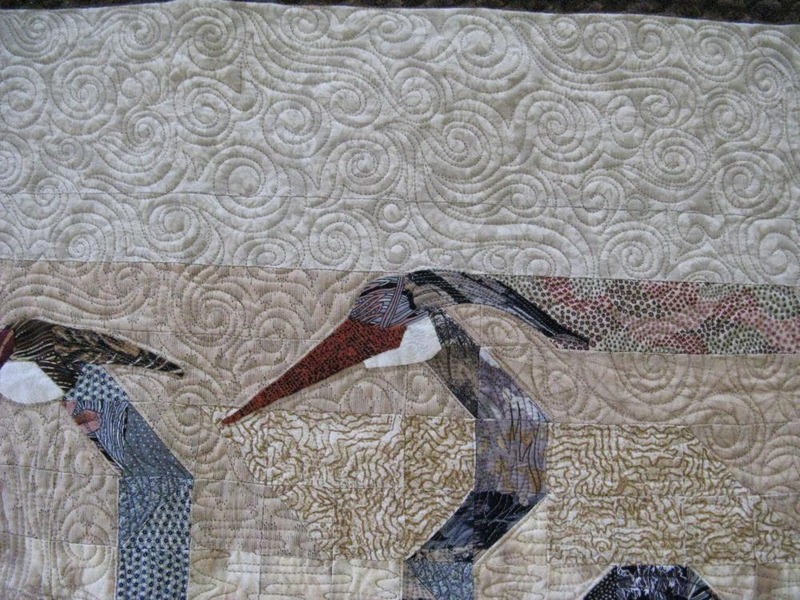 Katie's art quilt is stunning, and I am in awe of Becky, Sandi, and Debra for completing one of Bonnie Hunter's quilts. Kudos to you, as those would probably still be UFO's in my house. Based on Nell's light repurpose, I may need to borrow (steal) my husbands. Great idea! And Martha...Is your machine smoking yet? Way to make a dent in your UFO's And congratulations to all of the other finishers. This has been an inspiring parade.